I'm excited to participate in Veg Plotting's Out on the Streets: Sparkly Festive Edition — first as a reader and now as a poster. Art Institute of Chicago. Check out the lighted garlands, the decorative pots, and of course the wreaths around the necks of the lions. Mr Brown Thumb thought they were the colors used in the city's bid to host the Olympics. 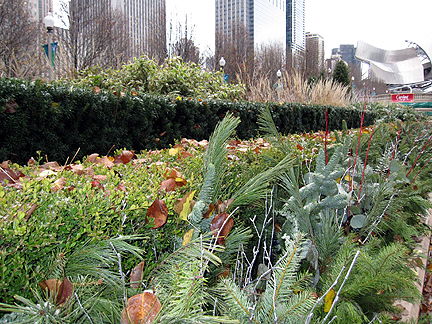 Evergreen boughs and red-twig dogwood edge the planting beds in Millennium Park. 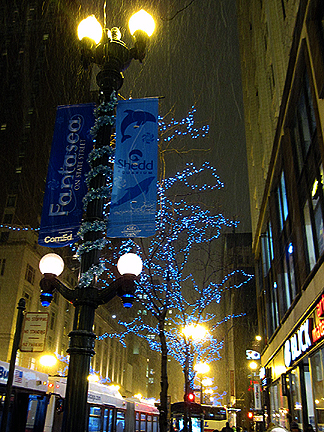 Blue lights on trees and Seussian-looking horns adorn Macy's, on State Street. 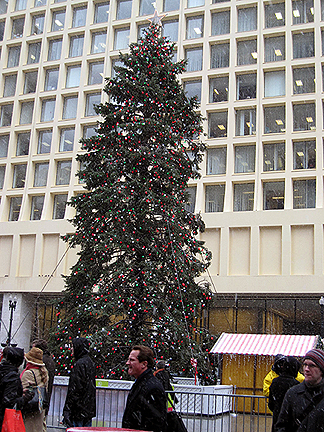 Chicago's Christmas tree, in Daley Plaza. This is one single tree, donated by the Weivoda Family of Palos Heights, Illinois. In previous years, the tree was made of 113 smaller trees. It looked more full, but imho, less realistically tree-like. I do miss the ornaments from last year, though. 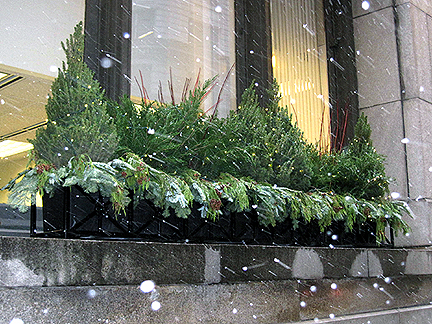 Evergreens in a widow box really brighten up the business section of downtown. I love how the big fluffy flakes of snow look in the photo, too. On the walk back to Union Station, we passed more blue lights, this time really set off against the dark backdrop. On Sunday, I went with my friend Julia to Greenfield Village, in Dearborn, Michigan. Greenfield Village is an outdoor collection of historic buildings that recreates life in the 18th and 19th centuries. Most buildings were brought to the village from different locations, most allow entry, and a few have historic gardens. Costumed interpreters demonstrate cooking, candle making, glass blowing, typesetting, pottery making, and tin- and blacksmithing, among other things. Wright Brothers Cyclery on Main Street. It's not so obvious but the lamp posts are wrapped in garland, and lights are stung between lamps. I love the sleigh and tree on Robert Frost's house. 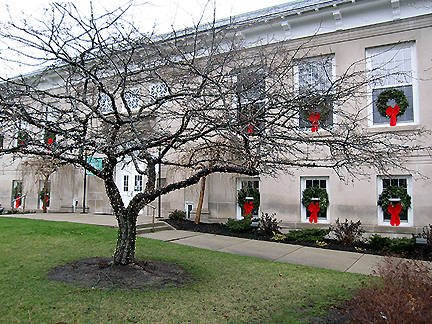 He lived in this house, which was moved from Ann Arbor, during his teaching fellowship at the University of Michigan in the 1920s. 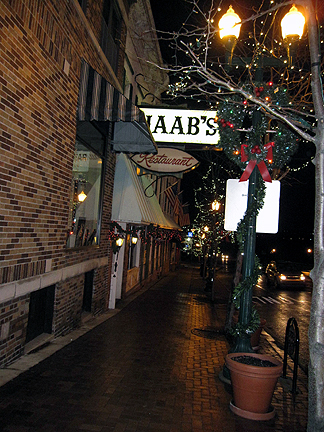 Haab's Restaurant on Michigan Avenue. 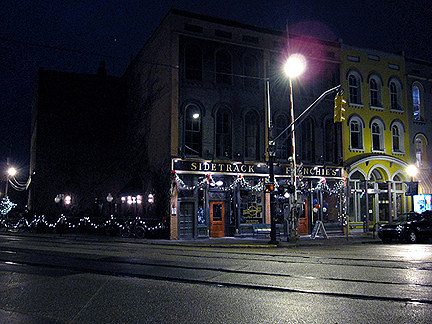 Sidetrack Bar & Grill on Cross Street in Depot Town. 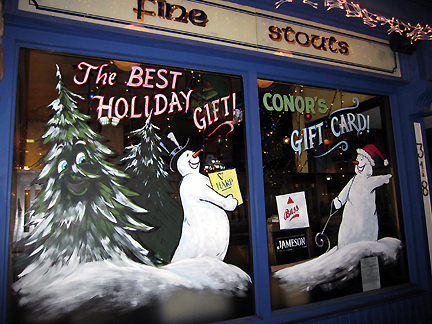 Wonderful window art at Conor O'Neill's Irish Pub. 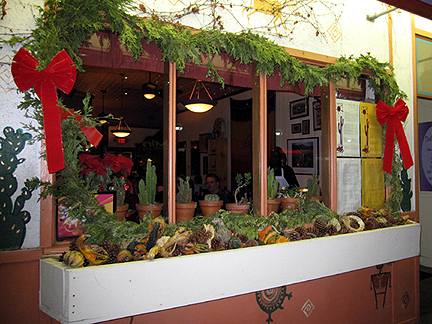 Window display at Prickly Pear restaurant. 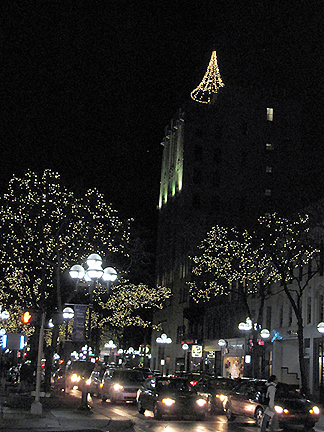 Lights on Main Street, and lighted tree atop the First National Bank Building. Now it's your turn! 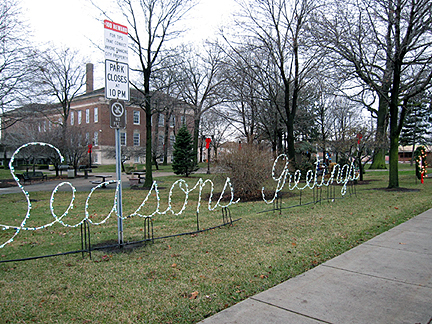 Get out and show us photos of public spaces in your area, decorated for the holidays. In my last post, I promised a prize for anyone who could guess my favorite sculpture at Meijer Gardens and tell me where "Caw! I guess it was alive!" comes from. The main clue about my fave (Aria by Alexander Liberman) was that I showed three photos of it, more than of any other sculpture. And I'm wild about orange, though maybe I haven't been so vocal about that online. The quote is from Mounted Animal Nature Trail by the Arrogant Worms. I've seen them live twice and really enjoy their quirky humor. The last time I checked, four intrepid, clever garden bloggers came up with the correct answer: Frances at Fairegarden, Jessica at The Magical Mundane, Kylee at Our Little Acre, and Liz at Nutty Gnome. So I did a drawing, diligently supervised by my cats (meaning James pawed around the slips of paper to shuffle them)... and I pulled out... Liz's name. So, Liz, soon on the way to you will be "The Painted Garden: A Year in Words and Watercolors" by Mary Wootin. If you should happen to already own this book, don't be shy: I can pull another from Monica's Marvelous Bookshelf (tm). And please email me your mailing address. How beautiful! Those of us who are transplanted Yankees love to enjoy snow via the internet, so this was a treat! I like how both the "business district" and bank seem to have realized you can be conservative in decor but still very beautiful! I was surprised to see Robert Frost's house at Greenfield Village, but now I remember when reading about Henry Ford in the biography of Luther Burbank, "A Garden of Invention," that he brought in all these historic buildings from all over the country. I think he was a fan of Frost, too. That was fun! I'm going downtown Chicago tomorrow, so I'll be seeing a lot of the same things you saw. 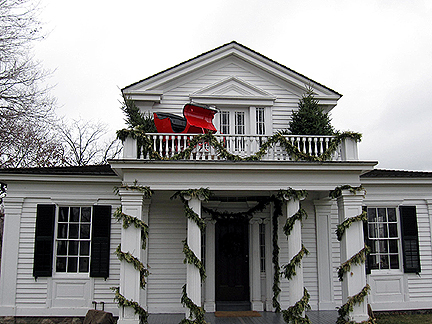 I like Greenfield Village's decorations, so green and tasteful. Hi Monica....some lovely Christmas displays there. Blue lights seem to be popular here this year. I love revolving doors too! These OOTS posts are really helping me get in the festive mood. Many thanks for getting involved with such enthusiasm! I love all the lights. I am not overly keen on the rush and commercialism of the winter holidays, but the lights are beautiful. -can you hear the chirpy little woops of glee? Commiserations to Frances, Jessica and Kylee because they worked hard to get the answer too! I haven't got "The Painted Garden: A Year in Words and Watercolors" by Mary Wootin, although I've heard a lot about it, so I'm delighted that that's my prize ....definitely worth the hours spent on Google to find that quote!!! I'll email you my address. Thanks again! ....and it’s snowing too – my day is complete!!! Liebe Monica, mit Vergnügen habe ich mir Deine Impressionen aus dem weihnachtlichen Chicago angeschaut. Ich wünsche Dir schon heute ein wunderschönes Weihnachtsfest und einen guten Rutsch in ein gesundes glückliches inspieriertes NEUES JAHR! Good morning Monica. 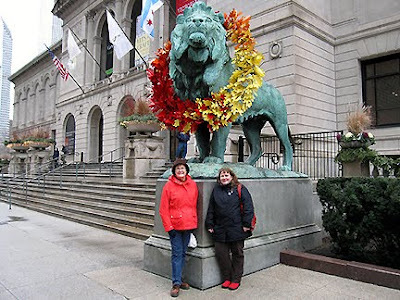 I have a photo of myself taken beside that very same lion;) (That was eons ago.) 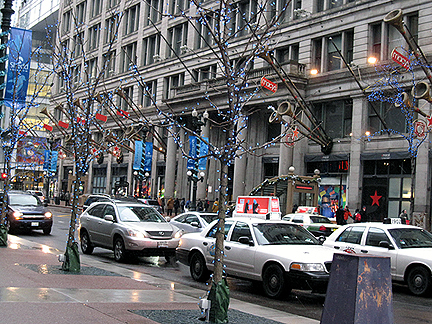 Wonderful photos, I wouldn't want to live in downtown Chicago but the energy of the city is wonderful during the holidays. Having been on day trips with you, I can easily imagine you going through those revolving doors to take that photo! And I knew your favorite sculpture, but I didn't think it would be fair to guess, since I was with you at the time. LOL. 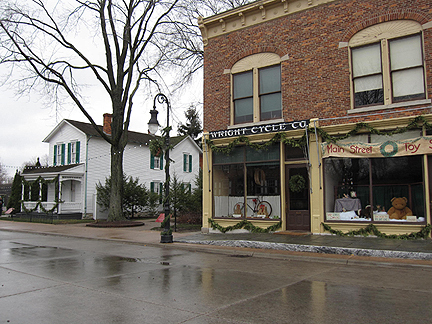 I have got to get over to Greenfield Village next week and enjoy the decorations before the village closes for the rest of the winter. I can feel it here. Christmas is around the corner. Beautiful. I can feel the chill, too! And congrats to Liz for winning the book. Your bag is done. I just have to finish the drawstring. Sorry this is taking so long. I have not forgotten or given up the project. I worked on it all the way to LA. I forgot about how many times you went around the revolving door. I think the best way to visit Chicago is thru your pictures. Happy Holidays to you Monica. It was wonderful seeing all of the Christmas lights and decorations. Robert Frost had a very nice house --- I wonder if he wrote his poetry in the garrett. 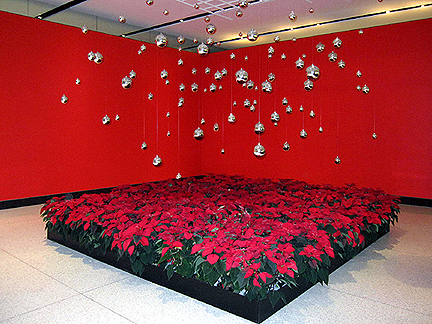 I love the silver tree ornaments overhanging the poinsettias. And OH MY GOODNESS I just included a Robert Frost poem in my most recent post! Freaky. I'm catching up on reading blogs - what a lot I've missed! Glad your cards arrived safely, Monica and glad you like them! If you take them out of the packaging you get the 3D effect best, and can always put them back into the packs again after Christmas. These Christmas decorations look amazing. I like the one with all the pointsettias (beyond the revolving door!) 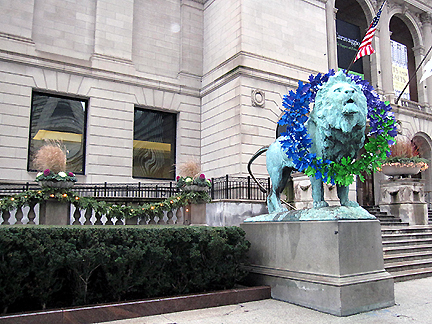 And the lions look glorious with their adornments! Looks to me as though you had a wonderful trip! You are Such a traveler!! :-) The book you gave away looks very intriguing. I'm going to have to look it up! :-) Merry Christmas to you, Monica!! Another great day out Monica. I enjoyed the tour round Chicago and look forward to hearing how you fared at the Christmas market. 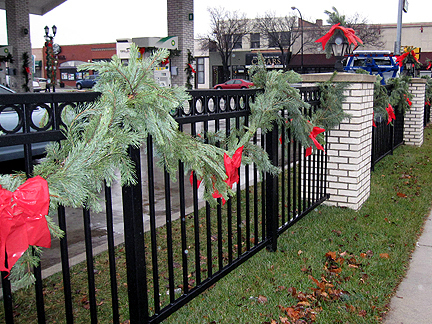 vielen Dank, dass Du mit uns durch das weihnachtlich geschmückte Chicago spaziert bist. Herrlich so manche Dekoration. Die Hörner gefallen mir sehr. Das Haus von Robert Frost sieht schon herrlich aus, aber der rote Schlitten ist wirklich ein Hit auf der Dach-Veranda. Auf Deinen Bericht vom Christkindlmarkt bin ich schon gespannt. Ich wünsche Dir und Deinen Lieben (pelzig oder menschlich) ein frohes und gesundes Weihnachtsfest. PS: Danke für Deine lieben Kommentare. Zu Deiner Frage: Nein, Nicki und Maxi vermissen Bonnie (glaube ich) nicht. Aber ich so sehr. Thank you for sharing these images. I miss CHICAGO! I went to school where those LIONS live many years ago. This year I missed the Christmas season in the windy city because we were in the land of the Green - IRELAND. Thank you for sharing a wonderful city dressed for winter. das sind ja tolle Fotos. Eine meiner Lieblingsdekorationen ist die Lobby mit den vielen Weihnachtssternen und den Kugeln oben drüber. Neulich im TV habe ich eine Dokumention über eine amerikanische Stadt - Columbus/Ohio - mit einem Dresdner "Striezelmarkt" gesehen (die Stadt ist wohl mit Dresden verschwägert.) So breitet sich der deutsche Weihnachtsmarkt immer mehr aus. - Ich bin gespannt, was morgen hinter deinem Türchen zu finden ist.